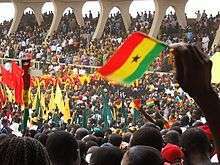 Not to be confused with black nationalism which defines national identity in purely racial terms..
African nationalism is an umbrella term which refers to a group of political ideologies, mainly within Sub-Saharan Africa, which are based on the idea of national self-determination and the creation of nation states. The ideology emerged under European colonial rule during the 19th and 20th centuries and was loosely inspired by nationalist ideas from Europe. 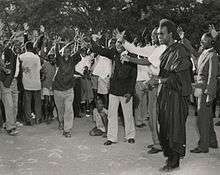 Originally, African nationalism was based on demands for self-determination and played an important role in forcing the process of decolonisation of Africa (c.1957-66). However, the term refers to a broad range of different ideological and political movements and should not be confused with Pan-Africanism which may seek the federation of several or all nation states in Africa. Nationalist ideas in Sub-Saharan Africa emerged during the mid-19th century among the emerging black middle classes in West Africa. In its earliest period, it was inspired by African-American and Afro-Caribbean intellectuals from the Back-to-Africa movement who imported nationalist ideals current in Europe and the Americas at the time. The early African nationalists were elitist and believed in the supremacy of Western culture but sought a greater role for themselves in political decision-making. They rejected African traditional religions and tribalism as "primitive" and embraced western ideas of Christianity, modernity, and the nation state. African nationalism emerged as a mass movement in the years after World War II as a result of wartime changes in the nature of colonial rule as well as social change in Africa itself. Nationalist political parties were established in almost all African colonies during the 1950s and their rise was an important reason for the decolonisation of Africa between c.1957 and 1966. However, African nationalism was never a single movement and political groups considered to be African nationalists varied by economic orientation and degrees of radicalism and violence. African nationalism in the colonial era was often framed purely in opposition to colonial rule and was therefore frequently unclear or contradictory about its other objectives. According to historian Robert I. Rotberg, African nationalism would not have emerged without colonialism. Its relation to Pan-Africanism was also ambiguous with many nationalist leaders professing Pan-African loyalties but still refusing to commit to supranational unions. African nationalists of the period have also been criticised for their continued use of ideas and policies associated with colonial states. In particular, nationalists usually attempted to preserve national frontiers created arbitrarily under colonial rule after independence and create a national sense of national identity among the hetrogenous populations inside them. 1 2 Rotberg 1966, p. 33. ↑ Davidson 1978, p. 165. ↑ Davidson 1978, pp. 166-7. ↑ Davidson 1978, p. 167. ↑ Davidson 1978, p. 202. 1 2 Davidson 1978, p. 374. 1 2 Rotberg 1966, p. 37. Davidson, Basil (1978). Let Freedom Come: Africa in Modern History (First US ed.). Boston: Little-Brown. ISBN 0-316-17435-1. .
Hodgkin, Thomas. Nationalism in Colonial Africa (1956). Hussain, Arif. "The educated elite: collaborators, assailants nationalists: A note on African nationalists and nationalism." Journal of the Historical Society of Nigeria 7.3 (1974): 485-497. Ohaegbulam, Festus Ugboaja. Nationalism in colonial and post-colonial Africa (University Press of America, 1977). Rotberg, Robert I. (May 1966). "African Nationalism: Concept or Confusion?". The Journal of Modern African Studies. 4 (1): 33–46. JSTOR 159414. Shepherd, George W., junior (1962). The Politics of African Nationalism: Challenge to American Policy. New York: F.A. Praeger.